Cast a chart for the Sun's ingress into each of the four cardinal signs, i.e. 00 deg of Aries, Cancer, Libra, and Capricorn. This chart is set using the coordinates of your location but using GMT rather than the time zone of your location, if that differs. This will give you the seasonal influences for the year ahead. From this chart you are able to see the temperature variations that will occur in this location. The four phases of the moon each month - new, first quarter, full, and last quarter. These give the weekly trends. They cover the moisture picture for the week that the chart is in effect. Mercury ingress charts cover the air movement for the period of time that Mercury is in a particular sign. The relevant period of time for these charts may vary. The sunrise chart is set for your personal location and may be read in conjunction with the other charts regarding conditions that they show for a particular day. The charts are interpreted using the 4th house as the main indicator followed by the first house. 50% of the overall prevailing conditions are described by the planets in the 4th house, their sign and the aspects they make to other planets, followed by the sign on the cusp and its ruler. 25% is from the 1st house - using the same formula. The remaining 25% is from the rest of the chart and in particular any planet in a close approaching aspect to the MC. First, note the planets in the 4th and 1st Houses - make notes of all of the effects of these planets. These notes will be your 'forecast' against which you will compare and note the actual weather for a lunation period. About half of the conditions of the forecast are described by the planets in the 4th House, the sign they are in and the aspects to other planets and sensitive points. Include the sign on the 4th house cusp as the next influence. About one quarter of the information comes from the planets in the 1st house, the Sign they are in and the aspects they make. The rising sign or ascendant is a secondary influence. Look also at the planets which rule the 1st and 4th house and consider their signs and aspects. Pay close attention to planets which are conjunct angles. These are very important and may override much of the sign descriptions. If these angular planets make hard aspects they too need to be noted. The 4th house shows 1/2 of the weather pattern. The 1st house shows 1/4 of the weather pattern. 1/8 is found in the 10th and 7th houses. Sun - warm, dry, calm unless in violent combination. Primarily gives a more marked effect when mutually aspecting planets also aspect the Sun in combination with the Moon, in which case it gives extreme weather conditions. Sun/Venus conjunction cloudy or rainy. Moon - chilly, wettest of all planets. The lunar ingress into the cardinal signs (especially Capricorn) has an intimate link to record rainfall, especially via Jupiter's angularity. Venus and the Moon tend to be positioned on or near the angles of the ingress chart in higher than normal rainfall. The Moon's role is that of a trigger. Mercury - wind, cool to cold, tends to dryness. Mercury governs the wind and corresponds to high pressure of fair weather. Gentle breezes to hurricane-force winds can be found under Mercury's domain. Mercury to the conjunction of Saturn, Uranus, Neptune and Pluto before the storm event may denote the type of wind force that may eventually work out into the environment. Causes fall in air pressure. Mercury/Uranus sudden squalls or violent gusts, Mercury/Saturn steady increase in wind strength more rain when retrograde. Venus - a warm, moist influence tending to lower the barometer. Moderately warm temperatures and gentle showers are among Venus's trademarks. In winter, it tends to augment snowfall or freezing rain. Moisture, moderating influence, consistently wet. Venus/Mars combinations often refer to storms. Mars - acute heat, extreme if combined with other violent planets. Warm and dry influence. Hot summers, droughts, and mild winters are a few of its traits. Jupiter - warm, pleasant breezes, under the right conditions can be a big wind, tends to dryness. By itself, Jupiter is considered a fair weather influence, bringing temperate conditions and an invigorating atmosphere. Jupiter raises temperature. Saturn - cold, wet, long lasting, extended gloom, stubborn and determined. Typically produces cold and damp conditions that can be further aggravated when other testimonies concur. Storms or low-pressure systems engendered under Saturn are more prolonged and widespread. Fall in temperature rainfall. Saturn aspecting Sun brings gloomy cold weather. Uranus - cold, dry, record breaker, unexpected changes, reversals, unstable, lightning, squalls. Cold, dry air masses resulting in winter freezes and summer cold fronts are attributed to the power of Uranus. High barometer and very high wind velocities can be found under its influence as well. Sudden, windy, rainy, cold. Neptune - cool, wet, fog, mist, erosion in an earth sign, peculiar, freakish weather events, flooding. 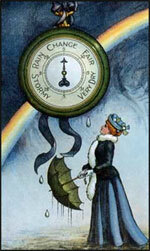 Neptune's power lies in its ability to lower the barometer and provoke torrential downpours and flooding conditions. During colder seasons, warming trends and thaws are typical of a Neptune influence. Dry and warm, stormy. Pluto - cool, violent, extremes, severe and intense depending on other chart indications. Some believe Pluto's effect to be similar to that of Mars. Aries - warm, hot, dry - a moveable sign and can bring in some wind. Taurus - cool, wet, a moderating influence and can be steady; farmer's rain. Gemini - tends to cold, dry, fair; clouds moving, open sky, fluctuations in temperature. Cancer - cooling off to cold; wet, chance of rain with downpours; short-term wet. Leo - hot and dry; the most 'still' sign; in winter, melting snow. Virgo - cold, dry; on the cool side with winds; blustery. Libra - cool, lowers temperature rather than heats; airy breezes, favours dry; pleasant. Scorpio - extremes, really wet/dry or hot/cold, con/destructive; oppressive. This sign intensifies the action of the rest of the chart. Never fails to bring an extreme. Sagittarius - warm, dry, clear and sunny; pleasant. Indian summer; January or February thaw. Capricorn - coldest, storms; low temperatures in winter; can add to heat in summer. Can be severe and long; periods of wet, especially on 1st or 4th. Aquarius - cold, dry and crisp; lightning; very changeable; adds to potential for storms. Pisces - cool, wet, mild; seasonable. Moderates indications; is second to Taurus in its moderate influences. The traditional astrological aspects - the conjunction, sextile, square, trine, and opposition - and parallel of declination, are important keys in determining weather patterns. The conjunction and parallel can fall into either category, depending on the planets involved. Even Venus and Jupiter can produce severe weather when harshly aspected, as is the case when they are coupled with Neptune. Conjunctions can work either way and are considered the most powerful aspect of all. In season, the Sun-Mercury conjunctions often coincide with the formation of tropical storm systems and hurricanes. Squares and oppositions can produce plenty of trouble or difficulty, especially aspects between Mars, Saturn, Uranus and Neptune. The square and opposition are considered to be storm breeders. Squares and oppositions between Mars and Saturn or Mars and Uranus can engender some very energetic storm systems. Trines can offer a flow to the energies. The trine and sextile induce fair weather. The descriptions of each planet must be blended keeping weather patterns in mind. For example, Mars usually indicates hot weather. In conjunction with Saturn (cold, wet, extended gloom) there is likely to be a meeting of two weather fronts creating the potential for thunderstorms. Whole seasons are affected when the slower-moving planets from Jupiter outwards form major aspects. © Kim Farnell. Published on skyscript: 21 December 2005.